Amber Jamison fights off a defender. The junior guard will look to take on a primary scoring role after the departure of Nia Coffey. Amber Jamison is about to be thrown into the fire. Last season, the sophomore guard was more likely to be found on the bench than the floor. 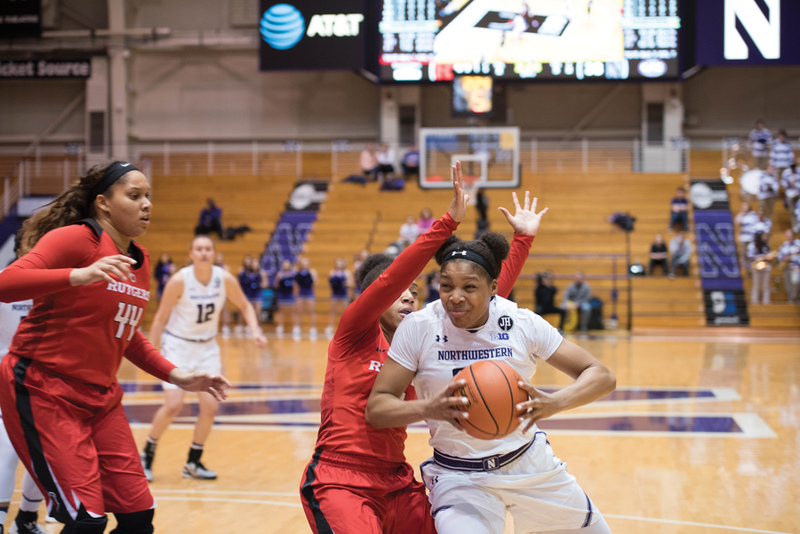 Even when Jamison was in the game, the ball was often in the hands of Nia Coffey, Northwestern’s best scorer who graduated last spring and was taken fifth in the 2017 WNBA Draft. Now, Jamison sees herself taking on a more critical role, ideally with the ball on the left wing about 20 feet from the basket and the opposing team’s best defender in her face. Coffey is gone, and Jamison is going to start. She is ready to score. The Wildcats’ goal to return to the NCAA Tournament for the first time since 2015 hinges on improvement across the board following the graduations of Coffey, Ashley Deary, Christen Inman and Lauren Douglas — last season’s top four scorers. Replacing Coffey, who averaged 20 points per game as a senior, could be a season-long process, and McKeown said he isn’t sure who he’ll turn to with the game on the line. He added that uncertainty can be a coach’s biggest nightmare, and NU has 57 points per game and an unpredictable number of crunch time, nail-biting chances up for grabs in the absence of its graduated players. Jamison wants to fill the void. Scoring is her favorite thing to do, she said, and now she has more opportunities. Jamison came off the bench last season, playing 17.5 minutes per game and averaging just 4.9 points. She mostly shot 3-pointers as a freshman, watching either Coffey, Inman or Deary bear the responsibility of creating chances. They were the ones with the ball in her favorite place on the floor. But those three are gone, and McKeown said NU needs a guard who can attack the basket and create opportunities for others. Everyone’s usage is going to climb, and he is especially excited to see Jamison diversify her game. While the physical junior guard operates from the left wing, the other starters have strengths that fit together well. Senior guard Lydia Rohde and sophomore forward Abi Scheid are returning contributors and perimeter threats. Freshman Jordan Hamilton, an ESPN top-100 recruit, has already stepped up as a point guard who plays at a faster offensive pace than Deary. Within a group with little starting experience, Jamison will have to grow, both as a scorer and a leader. McKeown said she will have one of the longest leashes even if she struggles to find early success adjusting to the Cats’ changed style of play, a different arena and four holes in the rotation. Though Jamison said she is working to become the team’s primary option on offense, she isn’t intimidated by the shoes she has to fill. Thinking about the Cats’ loss in talent just distracts her from making her jump shot.